Robert Tomanovich doesn’t have any plans to remove the nooses hanging from trees outside his home and business, and police say they can’t make him. A Michigan man has the Confederate flag and nooses hanging from trees in the yards of his home and business and doesn't think it's a problem. He has no plans to take any of them down, and one of his business workers told news station WXYZ, "We're gonna put more up." 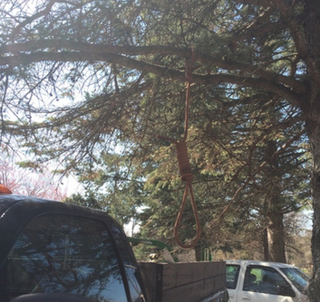 Robert Tomanovich's Livonia neighbors at both his home and his business—Robert's Discount Tree Service—told the news station that the Confederate flag is one issue, but they really grew concerned when nooses began being hung from trees on his property. "It's a tree that is easily climbable," Nicole Behrendt, a neighbor, told the news station. "Any kid could climb the tree and hang himself." Mary Greer, who lives near Tomanovich's business, told the news station, "One hundred fifty years after Abraham Lincoln's death, we are still going through this kind of atrocities. A hangman's noose and a Confederate flag?" Tomanovich refused to speak with WXYZ, but one of his workers told the news station that he didn't care what the neighbors had to say. "Screw 'em," he said of those offended, and added that the nooses were hung after the business received complaints about their work. When the news station asked if they planned to take them down now that several neighbors had complained, the longtime worker, who didn't give his name, responded, "Hell no." He then added, "We're gonna put more up." According to WXYZ, one neighbor has created and distributed fliers asking that everyone boycott Tomanovich's business until the nooses are removed. Tomanovich's wife, Lindy, doesn't see what all the fuss is about, considering that her husband's family is from the South and they merely like the look of the flag. As for the nooses, she explained that they serve a sentimental purpose. "Robert has a friend that died in that way [hanging himself], and that's in memory of his friend," she told the news station. She added that none of the items are meant to be racist and that the neighbors who see it that way might just be making something out of nothing. "Well, maybe they got too much time on their hands," she said about those who insist the nooses come down. "There's no crime in hanging a noose." Livonia police agree with her. They told the news station that since the hanging of the nooses wasn't directed at a specific person or group of people, it is unlikely that doing so would constitute a hate crime. Police officials did add that they are "open to assisting in mediating the situation," WXYZ reports.